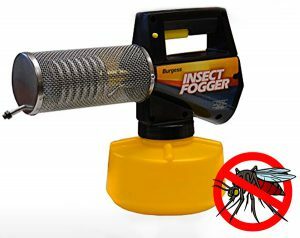 If you have mosquitoes in your yard or in your home, buying a fogger as the best mosquito killer may be the answer. Mosquitoes can ruin an evening outdoors. Not only do they cause annoying bites, they can also carry dangerous diseases like malaria and dengue fever. Mosquito foggers are a cost-effective way to eliminate mosquitoes and other flying insects without having to hire an exterminator. Most foggers are very easy to use. They can quickly get rid of these pests, so you can enjoy more time outside with your family. Here are our picks for the best mosquito killers on the market. The Burgess 1443 is one of the most popular mosquito killer on the market, and it’s not hard to see why. 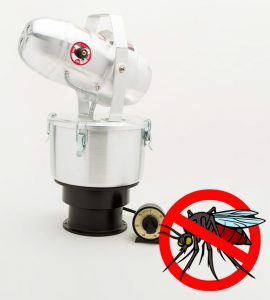 This is a professional-grade mosquito killer that homeowners can easily use themselves, even if they have no previous experience with foggers. It will leave you with an insect free yard for at least six hours after use. Investing in the Burgess 1443 is much more affordable than calling up the pest control company on a regular basis. The Burgess 1443 is a propane-powered fogger, and it’s innovative design allows it to disperse a 10-foot cone of spray that’s finer than mist, which easily penetrates shrubs and dense foliage. In order to operate the Burgess 1443, you must attach a 14.1-oz. tall-style cylinder or a 16.4-oz. short-style propane cylinder. The cylinders are sold separately. One tank will give you over two hours of continuous fogging. Since the fogging treatments only take a few minutes and are very effective, one propane tank should last you for several months. When you purchase the Burgess 1443, you’ll be getting a fogger that’s fairly simple to set up and start using. Just fill the reservoir with insecticide, attach the propane tank, light it, and allow it to preheat for two minutes. It only takes a few pumps of the trigger to disperse the insecticide over an area. After you spray your yard, you’ll need to wait five minutes before it’s safe for people to enter the area. The Burgess 1443 is fully portable, so it’s a great option to take with you on camping trips or to outdoor events. 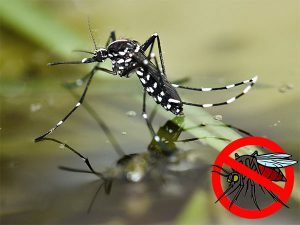 The fogged area should remain free of mosquitoes and other flying insects for at least six hours, although some owners report having mosquito-free yards for several days or even a week after fogging. Buyers who prefer a cold fogger to a propane-powered unit will no doubt love the Hudson 99598. This is a ULV (ultra low volume) fogger that uses air pressure to turn insecticide into a fog of fine particles. With a reach of 13.5 feet, it’s very effective at eliminating mosquitoes in large outdoor areas. The fog it produces can easily penetrate dense foliage. It has a flexible, commercial-grade hose that allows you to accurately target specific areas. 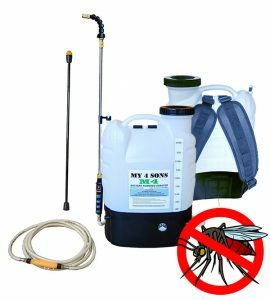 Along with mosquito elimination, the Hudson 99598 can be used get rid of insects in your garden. The nozzle can be adjusted to change the discharge rate of whatever liquid insecticide you’re using. This fogger comes with the lightweight tank that holds up to two gallons of insecticide. Because of the tank’s size, you won’t have to stop to refill it very often, so you’ll be able to cover a large amount of ground very quickly. The downside of the Hudson 99568 is that it may seem too large and cumbersome for some users, even with the carrying strap. The fogger itself weighs 11 pounds, and when you fill the tank to capacity, the entire unit can weigh up the 20 pounds. The other main downside of this unit is that it must be plugged into an electrical socket or attached to an extension cord, which gives it limited portability. The Longray Basic is a high-quality ULV fogger that is a great alternative to the Hudson 99598 for those who want something a little smaller. At 8.6 pounds, the Longray Basic is lighter than the Hudson 99598, but it still produces a dense fog that is effective for eliminating mosquitoes and other biting insects. 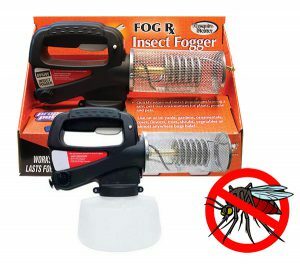 Even if you live in a wet area with a lot of mosquitoes, this fogger should be able to do the job. The one-gallon tank is easy to fill, so you can start using the fogger quickly. Once the tank is filled to capacity, you should have more than enough insecticide to fog a medium-sized property. This fogger is made from very durable materials, so it should last you a long time. You can put water-based or oil-based chemicals in the container without worrying about damaging it. One of the best features of this fogger is the adjustable swirl nozzle, which allows you to easily control how much fog you’re putting out. You can adjust it from 0–6.3 gallons an hour depending on the job you’re doing. As with all ULV foggers, this one runs on electricity. You won’t have to worry about the safety hazards or emissions related to propane-powered units, but you will have to keep it connected to an electrical outlet. For people who want a backpack fogger that can do tough jobs, this 4-gallon sprayer from My 4 Sons may be their best bet. One of the main advantages of using a backpack sprayer is that you’ll be able to target small areas without spreading insecticide to places where you don’t want it. This unit comes with an adjustable brass nozzle that’s perfect for such a use. It has the capability of spraying over 30 feet, so it’s also good for covering large outdoor areas. This sprayer offers both convenience and efficiency. It’s powered by a rechargeable battery. You should be able to get eight hours of continuous use out of one charge, so it’s unlikely that you’ll need to stop what you’re doing because the battery is out of juice. Helpful indicator lights signal when it needs to be charged. With a four-gallon tank, you should be able to fill it up with more than enough insecticide to cover your property. Additionally, the tank has a wide mouth, which makes it very easy to fill without worrying about spilling insecticide or other chemicals. If you’re looking for a fogger specifically to kill mosquitoes in a small backyard, this unit may be overkill. It’s mostly recommended as a multi-purpose tool to eliminate insects and weeds over large areas. Backpack sprayers do tend to get heavy on longer jobs, but you can purchase a rolling cart separately if that becomes a problem for you. 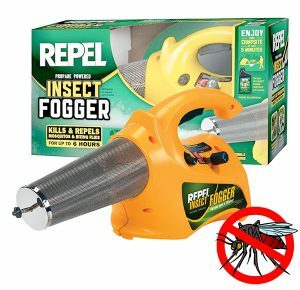 Repel has a reputation for making high-quality pest control products, and the 190397 Propane Insect Fogger is no exception. This fogger is very simple to use, and it allows you to fog an area of 5,000 sq. ft. in 10 minutes or less. It takes a maximum time of five minutes for the fog to dissipate, and then you’ll be able to enjoy a mosquito-free outdoor area for at least six hours. Because this fogger is quick and convenient, it’s ideal to use before backyard parties or barbecues. The Repel 190397 is a propane-powered fogger, which means that it should only be operated outdoors. Using it indoors could present a safety hazard. In order to operate it, you’ll need to separately purchase either a 14.1-oz. tall-style or 16.4-oz. short-style propane cylinder. Although this fogger usually has a higher selling price than the Burgess 1443, it still represents a good value for the money and is much more affordable than hiring a pest-control service to repeatedly visit your property. The Tri Jet is a non-thermal fogger that’s powered by electricity. Made in the United States by Createch, it’s one of the most effective products of its type available on the market. Because this fogger doesn’t require heat to operate, it can be safely used indoors and outdoors. It’s able to disperse a large volume of mist over a wide area, which makes it great for use on residential, commercial, industrial, and agricultural settings. Along with mosquitoes, the Tri Jet can be used to eliminate many other types of pests, including fleas, ticks, and bed bugs. One of the most convenient features of the Tri Jet is that it allows users to adjust the size of the particles it disperses. If you’re using it for your backyard, the small-sized particles will probably do an adequate job , while large-sized particles might be best for a spacious commercial or industrial property. This fogger can be used with water-based and oil-based insecticides. It can also disperse odor-control products or disinfectants to eliminate mold and mildew from basements or other indoor areas. The Tri Jet is a stationary mosquito killer, so it’s not recommended if you want something you can carry around. 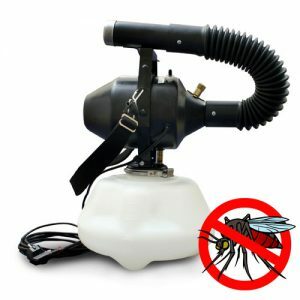 It’s also expensive when compared to many portable foggers, so if you just want a simple and affordable way to get rid of mosquitoes in your backyard, the Tri Jet may not be the best choice for you. For those in need of a fogger that can be used almost anywhere, however, this one should suit their needs. 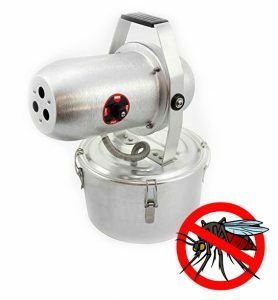 The Bonide 420 is a very effective fogger that works to eliminate mosquitoes, flies, moths, and gnats. It only weighs 2.7 pounds, which makes it portable and easy to take on camping trips. The fact that it leaves no active residue behind means that you won’t have to worry about the safety of your children or pets following application. The Bonide needs to preheat for five minutes, which is a longer preheating time than some other foggers require. The upside of this extended preheating time is that the Bonide 420 produces a very strong and dense fog, which makes it ideal for spraying areas with thick foliage. It’s best suited for use in an open area, however. If you have neighbors very close by, they may not appreciate the dense fog drifting onto their property. In order to use the Bonide 420, you’ll need to purchase a separate 14.1-oz tall-style propane cylinder. If you attach a shorter propane cylinder, and you may cause flames to come out of the nozzle. Additionally, the 420 uses propane gas to heat the coil, and it gets up to a high temperature. Because of this, it’s best to only use it outside. Operating it indoors could cause a fire risk. Bonide also recommends you only fill the reservoir with Bonide-brand insecticide, which can be inconvenient. The 420’s reservoir is translucent, which is a very handy feature for keeping track of how many insecticides you’ve used. If you have a pest problem inside your home and want to fully eliminate it, the Hot Shot fogger may prove effective for you. 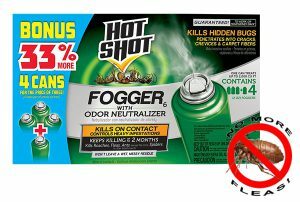 Hot Shot claims that one canister of their fogger can get rid of many different types of pests, including mosquitoes, fleas, roaches, spiders, and flies. 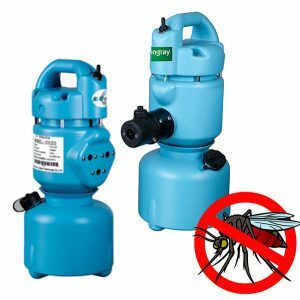 Once you release the valve, the insecticide will spread throughout your home, getting into small areas and crevices that would otherwise be difficult to reach. Using this Hot Shot fogger is probably much more cost-effective than hiring a professional pest exterminator. There are, however, a number of instructions on the package that you must follow carefully in order to avoid safety risks. You’ll need to leave the premises for at least two hours after your release the fogger and give the area another two hours to air out. You may also use Hot Shot 96181-1 as a flea terminator. The Silver Bullet is one of the best non-thermal cold foggers available on the market. With a powerful motor and tornado action nozzle, this unit is able to release a fine mist that can reach up to 40 feet in one spray. Although the Silver Bullet is a stationary fogger, it weighs less than six pounds, so it’s easy to pick up and carry from one location to the next. This fogger is designed to be used indoors and outdoors, and it can be an effective way to fumigate tight or otherwise inaccessible spaces. When you opt for the Silver Bullet, you’ll be able to effectively fight off mosquitoes from your outdoor area. It’s made from corrosion-resistant stainless steel, so you can fill it with many types of chemicals without worrying about it getting damaged. Not only is this fogger is great for eliminating outdoor insects, it can also be used for getting rid of mold and mildew indoors. The Fogmaster Jr is a small, electric-powered fogger that can be safely operated both indoors and out. It’s made from corrosion-resistant materials, which means it should last a long time and give you a good value for your money. If someone has never used a fogger before, the Fogmaster Jr should be easy for them to set up and start using. Along with insecticides, this unit can be filled with deodorizing liquids and used to eliminate odors. Its compact size makes it easy to maneuver in tight spaces. Foggers that are powered by electricity offer both pros and cons. Unlike propane-powered units, there’s no fire risk with electric-powered ones, so they can be operated indoors without worry. The downside is that they need to remain plugged into work, so you’ll need to be near an electrical outlet in order to operate the Fogmaster Jr. 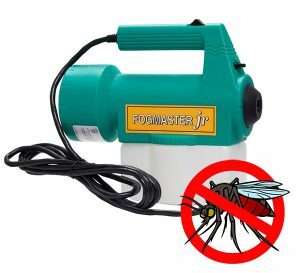 This makes the makes the Fogmaster Jr ideal for eliminating mosquitoes in small backyards. The nozzle will spray insecticide about 5 – 10 feet from the unit and the mist disperses quickly. Trying to eliminate mosquitoes in a large backyard may prove frustrating, however, so it’s not recommended for this purpose. Before you settle on which mosquito killer to buy, there are a number of things to keep in mind. You’ll need to think about which type of fuel you want to use and whether you prefer a portable or stationary unit. There are three main types of foggers to consider. Propane-powered foggers need to be attached to a small propane tank in order to operate. When you ignite the propane, it causes the insecticide in the reservoir to disperse in a dense fog. This type of fogger can be very powerful and is ideal for covering bushes and trees. Propane-powered foggers are portable, so it’s easy to cover a lot of ground with them, and they can be taken to campsites or picnic areas. The downside of propane-powered foggers is that you need to buy propane tanks separately. An electric-powered fogger uses electricity to heat up the insecticide, so it can be evaporated and dispersed. The major downside of this type of fogger is that you need to plug it in, so it’s not practical if you want to take it to a campsite or another outdoor area. On the plus side, electric-powered foggers are safer to use indoors, and you won’t have to buy propane tanks. ULV, or ultra-low volume, foggers are stationary, which means you simply set them up in one spot and let them affect the surrounding area. The benefit of this type of fogger is that it produces much smaller droplets of insecticide and creates a thicker fog, which means that an area can be fully covered. ULV foggers can be used outdoors or inside. They tend to be pricier than the other two types, but they’re highly effective at killing mosquitoes and other biting insects. There are a lot of foggers out there on the market, and the ten products listed here are all reliable options. 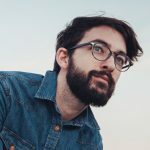 Getting rid of mosquitoes and pests yourself can help you save money on hiring a professional pest exterminator, so make sure you do adequate research before deciding which option you want to invest in. Determining which fogger is the best option for you is all about assessing your needs and figuring out your budget.